PE Central only collects personal information from persons who voluntarily give out their name, address, and e-mail. This takes place when persons choose to sign up to our free e-mail newsletter or submit an idea they wish to have published on PE Central. If published, we send their name and address, to our Primary Sponsor, S&S Discount Sports, who, in turn, mails them a gift certificate that they can use on purchases in their catalog. S&S Discount Sports does put their name on their mailing list. Teachers can choose to be taken off their mailing list by contacting S&S Discount Sports at 1-860-537-3451 or you can mail them at PO Box 513, 75 Mill Street, Colchester, CT 06415. If you subscribe to our newsletter, we may also send you third party offers that we feel may be of interest to you. 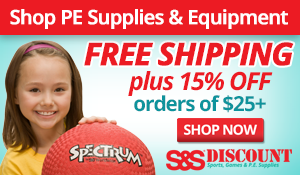 When visitors order items from our PEC Store they are being directed over to the S&S Discount Sports website at pe.ssww.com and asked to indicate their name, shipping and billing address, contact phone, email and their credit card or purchase order information. This is all done on secure servers. The personal information gathered and any other information collected during this ordering process is not shared with a third party. We use third-party advertising companies (e.g. Google Ads) to serve ads when you visit our Web site. These companies may use information (not including your name, address, email address, or telephone number) about your visits to this and other websites in order to provide advertisements about goods and services of interest to you. If you would like more information about this practice and to know your choices about not having this information used by these companies, click here. This site contains links to other sites. PE Central is not responsible for the privacy practices or the content of such Web sites. If you have questions about this privacy statement or the practices described above you can contact us using the information below. You should check back to this policy frequently, since it is subject to change from time to time, and your continued use of the site is conditioned upon your acceptance of any modifications hereto.